Picking the right home theater system for your crib is one of the biggest decisions you need to make. These systems are not exactly cheap hence you need to do some research first before purchasing a set. You can do this by reading reviews about such systems online or ask for referrals from friends, familymembers, and co-workers who have invested in their own setup. You can also ask for tips from helpful sales staff in electronics stores. To help you with your quest, we will provide reviews of systems being sold on the market right now. 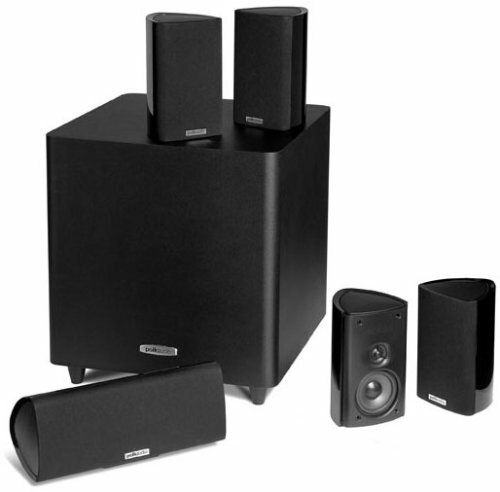 To begin, we have the Polk Audio RM705 5.1 Home Theater System. A quality home theater system is something you need in case you want to experience the rich, loud sound of a real theater in your own home. The best systems are often high-end, but there are also more affordable ones that are worth a try. While they cannot really match the muscle of such expensive setups, the good ones are indeed worthy of a shot. This system from Polk Audio includes items you need for a home cinema setup from center channel speakers, satellites, wall mount brackets, a surface mount support, an online registering card, and an instruction manual. It has a great design by way of its sleek black color and hyper-glossy finish. The subwoofer, which has a downward-firing characteristic, gives great fat bass and is one of the benefits of this setup. The speaker driver of this unit consists of polypropylene. One of its most convenient features is the enclosures of this unit, which are Reuleaux Triangular Polygon. These enclosures assist the center channel speakers and satellites to decrease distortion in sound and contain such sound waves within the speakers. The unit also comes with wall-mounting brackets so it can be fastened on the wall or in any spot around the room for maximum convenience. You won’t have to deal with worrying about over positioning the speakers right next to the television because it comes with magnetically-shielded speakers. These speakers will not interrupt with the picture of your television nor generate distorted audio. Another convenient feature of this product is that it comes with an Anti-Diffraction Baffle. This feature stops diffraction for better sound distribution. Due to its functions, users will get to experience all bits on the audio from the sound setup. Another technology that users have to look forward to in this unit is its Composite Driver, which assists the driver items of the sound setup to generate even frequency response and the best possible imaging. This leads to a sound system setup that users can fully appreciate at maximum volumes without excessive booming sounds. The speaker system features 100 watts in peak RMS rating, plus it comes with an 8-inch bass driver as well making for excellent performance without costing so much. It gave great sound at a competitive price. The sound output it provided was rich, had good clarity and a well-defined bass. While the loudness of the product was sufficiently good for most of us, audio experts might find it lacking compared to other products within the same price lane. Another drawback of the unit is that the setup can be a bit difficult to mount on the wall, requiring a more expert hand to accomplish the task. It also proved to be a challenge to fit in 14-gauge speaker wiring on its jacks. The Polk Audio RM705 5.1 Home Theater System is a good find for budget homeowners who want their very own home cinema setup. It is also a nice product for beginners to test the waters in case they do not want to splurge on a high-end product. It has a competitive price, gives great sound output with sufficient clarity, and features deep bass. However, this might not be the product for audiophiles who are very particular with the volume since it might not be that loud enough for them. Buying the right system is crucial when it comes to home cinema systems because for one, they are not exactly the most affordable items in the industry. Thanks to Polk Audio though, budget-conscious folks can now experience the home theater experience with their products.